The Londonist Literary List appears every Tuesday. If you'd like to bring an event to our attention, please email londonistlit@gmail.com. Mark Haddon, author of The Curious Incident of the Dog in the Night-time, which won the Whitbread Book of the Year Award way back in 2003, discusses his writing and latest book A Spot of Bother. £8.50 at the Royal Festival Hall, 7:45 pm in the Purcell Room, find out more. Kevin McCloud - designer, architect and TV presenter is discussing the tips in his new book Grand Designs Handbook at 6.30pm. £5, call 0870 420 2777 to buy, The Gallery at Foyles, 2nd Floor, 113-119 Charing Cross Road. Yasmine Ghata’s debut novel The Calligrapher’s Night follows the fortunes of calligrapher Rikkat under Ataturk’s new republic, in which Arabic script has been replaced by Latin and discusses the mysteries of life, time, death, and writing as an art. (event in French and English). 7.30pm, £3/ £2, Institut français, 17, Queensberry Place, SW7 2DT. 020 7073 1354. 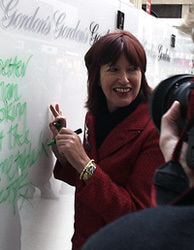 Writer and broadcaster Janet Street-Porter (pictured) introduces her new book, Fall Down, the widely anticipated sequel to her childhood autobiography Baggage, which chronicles her early years as a journalist in Fleet Street. 6.30pm, £6/£4, The British Library, Conference Centre, St Pancras. Tonight, contributors to the book Lebanon, Lebanon are joined by dancers, musicians and actors in this evening of stories, songs, dance and film, organised by English PEN in collaboration with Saqi Books, Index on Censorship and Open Democracy. All proceeds will go towards the work of Lebanese children’s charities. 7pm, £15 / £5 students, 020 7930 6601 for tickets, New Players Theatre, The Arches, Villiers Street, WC2N 6NG. Wintersmith is Terry Pratchett’s third book featuring the rowdy, blue-skinned Nac Mac Feegles, building on the success of The Wee Free Men and A Hat Full of Sky. Reading and discussion with Sarah LeFanu. 7pm, £7/£5, Logan Hall, Institute of Education, 20 Bedford Way, WC1H 0AL. Book tickets 0845 456 9876. Filmosophy by Daniel Frampton is a provocative manifesto for a radical new way of understanding cinema. Frampton argues that film style conveys poetic ideas through a constant dramatic 'intent' about the characters, spaces and events of film. Also taking part in the discussion are the writer and cultural commentator Jonathan Ree, the former head of BFI Publishing Geoffrey Nowell-Smith, and the Independent on Sunday's film critic Jonathan Romney. 7pm, The London Review Bookshop. Leading futurologist James Martin lays out the 15 challenges facing us for survival, and explores the choices we must make in order to guarantee our future in the timely The Meaning of the 21st Century. 6.30pm, £5, for tickets call 0870 420 2777, Congress Hall, Congress Centre, 28 Great Russell Street, WC1B 3LS. Returning after their summer break and fresh from the success of their first anthology, Tales of the Decongested offer the best in short fiction. 7pm, The Gallery at Foyles, free to attend, no booking necessary. William Boyd takes on the espionage novel in his new work, Restless, a thrilling portrayal of a female spy during the Second World War. 7.45pm, £8.50, Purcell Room, South Bank Centre, SE1. 08703 800 400 for tickets. The British Library hosts a super-charged panel discussion called 'Hot off the Press' bringing together four trail-blazing and controversial entrepreneurs and editors from the press and media to discuss how best to start and develop a business in the media. 6.15pm, £6/£4, The British Library, Conference Centre, St Pancras. Richard Dawkins puts forward his arguments for why our belief in the existence of a God is fundamentally flawed in The God Delusion. Billed as a must-see event for believers and sceptics alike. 7pm, £7/£5, 0870 420 2777 for tickets, Institute of Education, Logan Hall, 20 Bedford Way, WC1H 0AL.